Pollinica: leaves at 9:40am from San Agustín Church (Centre). Lágrimas y Favores: leaves at 10:45am from the Parish Church of San Juan Bautista (Centro). Humildad y Paciencia: leaves at 1:15pm from the Parish Church of San Vicente de Paul (Neighbourhood of Cruz de Humilladero - La Unión). Ecce Homo: leaves at 2:15pm from the Basilica and Royal Sanctuary of Santa María de la Victoria (Neighbourhood of la Victoria). ? Huerto: leaves at 4:30pm from the Parish Church of Los Santos Mártires Ciriaco y Paula (Centre). Dulce Nombre: leaves at 3pm from the Parish Church of La Divina Pastora (Neighbourhood of Capuchins). Salutación: leaves at 4:05pm from the Parish Church of San Felipe (Neighbourhood of Capuchinos - Molinillo). Salud: leaves at 5:30pm from the Parish Church of San Pablo (Neighbourhood of Trinidad). 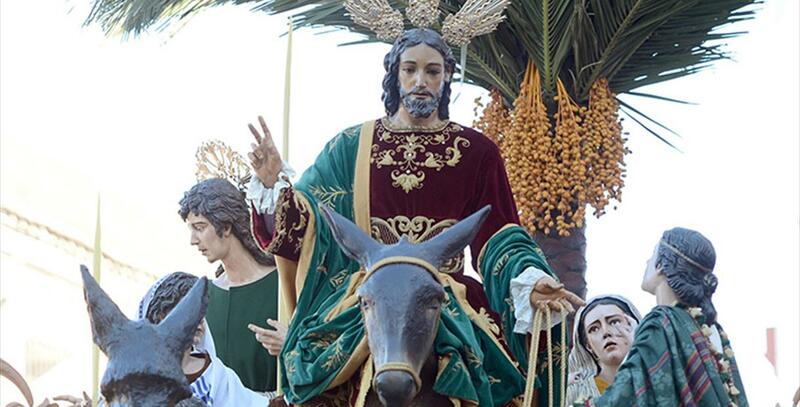 Prendimiento: leaves at 4:45pm from the Parish Church of La Divina Pastora (Neighbourhood of Capuchins).